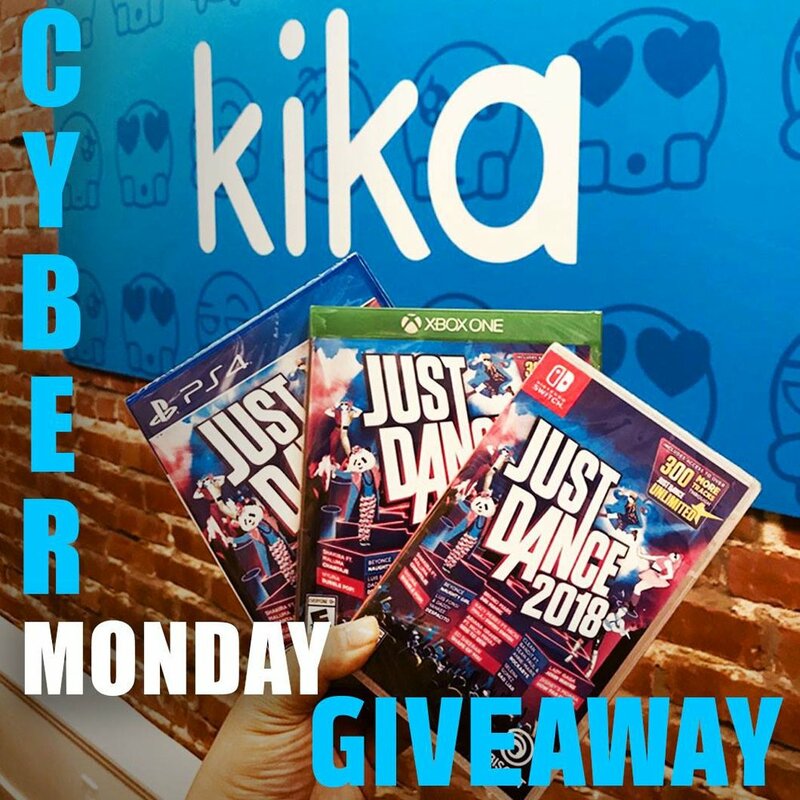 PROMOTION DESCRIPTION: Kika’s “Just Dance 2018” Facebook/Instagram/Twitter Contest (the “Contest”) begins on or about November 27, 2017 at 4:01 p.m. Pacific Time (“PT”) and ends on November 28 at 11:59 p.m. PT (the “Promotion Period”). Sponsor’s computer is the official clock for this Contest. Entry in the Contest does not constitute entry into any other promotion, contest or Contest. By participating in the Contest, each entrant unconditionally accepts and agrees to comply with and abide by these Official Rules and the decisions of Kika Tech, Inc., 8 N. San Pedro, Suite 230, San Jose, CA 95110 (“Sponsor”), which shall be final and binding in all respects. ELIGIBILITY: Only legal U.S. residents of the fifty (50) United States and the District of Columbia who are eighteen (18) years of age or older at the time of entry and have internet access are eligible to enter. Officers, directors and employees of Sponsor, Ubisoft and their respective parent, subsidiaries, affiliates, distributors, retailers, sales representatives, advertising and promotion agencies (all such individuals and entities referred to collectively, the “Promotion Entities”), and each of their immediate family members and/or people living in the same household are NOT eligible to enter the Contest or win a prize. This Contest is void where prohibited. Ubisoft is not responsible for the collection, submission or processing of entries, the administration of the Contest, the selection of winners or the fulfillment of prizes. Entrants are providing information to Sponsor and not to Ubisoft. HOW TO ENTER: To enter the Contest you must be a registered member of Facebook/Instagram/Twitter. Navigate to the Kika pages and follow directions on the post. Limit one (1) entry per person and/or Account. All entries must be received by the end of the Promotion Period in order to participate. Proof of sending uploading your post is not considered proof of such entry. By entering, you agree to comply with these Official Rules including all eligibility requirements. The Submission must meet the below guidelines and the following “Submission Requirements”: (i) excluding the Sponsor provided materials, the Submission must not feature or focus on any material owned or controlled by third parties (including without limitation, third party copyrighted material); and (ii) the Submission must not include images or language that are obscene, violent, pornographic, libelous, offend or denigrate any group or class of people, could reflect unfavorably on any of the Promotion Entities, defame or invade the publicity or privacy rights of any person, living or deceased, infringe upon any person’s or entity’s personal, commercial, or proprietary rights, or is otherwise objectionable. Sponsor shall have the right to disqualify any Submissions that Sponsor has determined, in its sole and exclusive opinion, fail to adhere to these Submission Requirements, expose Sponsor to any unacceptable degree of technical, legal, or financial risks or problems, use text and/or other components in a manner objectionable to Sponsor or its affiliates, or is otherwise deemed inappropriate, all as determined by Sponsor, in its sole discretion. Sponsor, in its sole discretion, may accept a technically incorrect Entry. Sponsor’s decisions are final and binding with respect to all matters relating to this Contest. Important Note: If you opt to use Facebook/Instagram/Twitter via your wireless mobile device (which may only be available via participating wireless carriers and is not required to enter the Contest), standard text messaging and/or data rates may apply for each message sent or received from your handset according to the terms and conditions of your service agreement with your wireless carrier. Other charges may apply (such as normal airtime and carrier charges) and may appear on your mobile phone bill or be deducted from your prepaid account balance. Wireless carriers' rate plans may vary, and you should contact your wireless carrier for more information on messaging rate plans and charges relating to your participation in this Contest. Participation in this Contest by mobile device means that you understand that you may receive additional messages by mobile device relating to this Sweepstakes, including to notify you if you are the winner, which may be subject to  charges pursuant to your carrier's rate plan. Mobile device service may not be available in all areas. Sponsor shall have the right to disqualify any entries that Sponsor has determined, in its sole and exclusive opinion, fail to adhere to these Sweepstakes Official Rules, or the Facebook/Instagram/Twitter Terms and Policies, expose Sponsor to any unacceptable degree of technical, legal or financial risks or problems, uses text and/or other components in a manner objectionable to Sponsor, or its affiliates, or is otherwise deemed inappropriate, all as determined by Sponsor, in its sole discretion (including but not limited to content deemed by Sponsor which contains violence, is sexually explicit or otherwise offends or denigrates any group or class of people or could reflect unfavorably on any of the Promotion Entities, or which defame or invade the publicity or privacy rights of any person, living or deceased, or otherwise infringe upon any person’s or entity’s personal, commercial or proprietary rights). Sponsor’s decisions are final and binding with respect to all matters relating to this Contest. Entry must be made by the entrant. Entries made by any other individual or any entity, and/or originating at any other web site or e-mail address, including but not limited to commercial sweepstakes subscription notification and/or entering service sites, will be declared invalid and disqualified for this Contest. Tampering with the entry process or the operation of the Contest, including but not limited to the use of any device to automate the entry process or use of more than one Account to enter the Sweepstakes is prohibited and any entries deemed by Sponsor, in its sole discretion, to have been submitted in this manner will be void. In the event a dispute regarding the identity of the individual who actually submitted an entry cannot be resolved to Sponsor’s satisfaction, the affected entry(ies) will be deemed ineligible. The Promotion Entities shall not be responsible for incorrect or inaccurate entry information whether caused by Internet users or by any of the equipment or programming associated with or utilized in the Contest or by any technical or human error which may occur in the processing of the entries in the Contest. The Promotion Entities assume no responsibility or liability for any error, omission, interruption, deletion, theft or destruction, or unauthorized access to, or alteration of entries. WINNER SELECTION AND NOTIFICATION: At the end of the Promotion Period, at least (1) Grand Prize winner will be selected randomly from the eligible submissions received during the Promotion Period based on contest rules. The winner will be announced on or about November 29, 2018. In the event of a tie, the judges (as selected by Sponsor), in their sole discretion, will deem a potential Grand Prize Winner based on the criteria “Fit to Contest Theme”. Decisions of the judging organization shall be final and binding in all matters related to the selection of winners. The winners will be contacted using their Facebook/Instagram/Twitter account. Sponsor is not responsible for any failure of delivery of notice attempting to use such methods. The potential Grand Prize winner will be required to respond to Sponsor’s notification within forty-eight (48) hours from notification and in accordance with the instructions therein or the Grand Prize may be forfeited. Winner will be required to provide (or confirm) information that includes, but is not limited to, the following: name, email address, street address, city, state, zip code, daytime telephone number, and date of birth, and verify eligibility per these Official Rules. Winners, and in the event that a winner is under the age of majority in his/her state of residence, his/her parent or legal guardian, may be required to execute and return a completed original notarized Affidavit of Eligibility/Release of Liability and (except where prohibited) Publicity/Name/Likeness Release form (collectively, “Prize Claim Documents”). Failure to fully complete, execute, notarize, and return all required forms as specified within this time period may result in the winner’s being disqualified, and in the event of any such disqualification or any other disqualification permitted under these Official Rules, or in the event that any Prize notification is returned as undeliverable for any reason, at Sponsor’s sole discretion, an alternate winner may be selected, or Sponsor may elect to not award the Prize to anyone. All federal, state, local and/or provincial/territorial tax liabilities, if any, are the responsibility of the Grand Prize winners. The approximate retail value of the Grand Prize is based on available information provided to Sponsor, and the value of the Grand Prize awarded to the Grand Prize Winner may be reported for tax purposes as required by law. The Grand Prize Winner may be required to provide Sponsor with a valid social security number or tax identification number before the Grand Prize will be awarded for tax reporting purposes. Entry into the Contest constitutes Entrant’s permission to Sponsor and its designees to use Entrant’s name, likeness, and biographical information for advertising and marketing and other purposes in any and all media, now and hereafter devised, worldwide in perpetuity, without further compensation, notification, or permission unless prohibited by law. PRIZES/ODDS: At least one (1) Grand Prizes are available. Winner will receive one Just Dance game. Approximate Retail Value (“ARV”) of each Grand Prize: $50.00. GENERAL PRIZE CONDITIONS: The prizes will be awarded only if the potential prize winner fully complies with these Official Rules. Any prizes pictured in point-of-sale, online, television and print advertising, promotional packaging, and other Contest materials are for illustrative purposes only. All details and other restrictions of the prizes not specified in these Official Rules will be determined by Sponsor in its sole discretion. GENERAL LIABILITY RELEASE/FORCE MAJEURE: Acceptance of a prize constitutes winner’s (or any minor winner’s parent or legal guardian) permission for the Promotion Entities to use winner’s name, photograph, likeness, voice, biographical information, statements and address (city and state) for advertising and/or publicity purposes worldwide and in all forms of media now known or hereafter developed, in perpetuity, without further compensation. Entrants (and any minor entrant’s parent or legal guardian) agree that the Promotion Entities (A) shall not be responsible or liable for, and are hereby released from, any and all costs, injuries, losses or damages of any kind, including, without limitation, death and bodily injury, due in whole or in part, directly or indirectly, to participation in the Contest or any Contest-related activity, or from entrants’ acceptance, receipt, possession and/or use or misuse of any prize, and (B) have not made any warranty, representation or guarantee express or implied, in fact or in law, with respect to any prize, including, without limitation, to such prize’s quality or fitness for a particular purpose. Sponsor assumes no responsibility for any damage to an entrant’s, or any other person’s, computer system which is occasioned by accessing the Website or otherwise participating in the Contest, or for any computer system, phone line, hardware, software or program malfunctions, or other errors, failures, delayed computer transmissions or network connections that are human or technical in nature. Without limiting the generality of the foregoing, Sponsor is not responsible for incomplete, illegible, misdirected, misprinted, late, lost, damaged, stolen, or postage-due prize notifications; or for lost, interrupted, inaccessible or unavailable networks, servers, satellites, Internet service providers, websites, or other connections; or for miscommunications, failed, jumbled, scrambled, delayed, or misdirected computer, telephone or cable transmissions; or for any technical malfunctions, failures, difficulties or other errors of any kind or nature; or for the incorrect or inaccurate capture of information, or the failure to capture any information. Sponsor reserves the right in its sole discretion to disqualify any individual who is found to be tampering with the entry process or the operation of the Contest or the Website, to be acting in violation of these Official Rules, or to be acting in an unsportsmanlike or disruptive manner, or with the intent to disrupt or undermine the legitimate operation of the Contest, or to annoy, abuse, threaten or harass any other person, and Sponsor reserves the right to seek damages and other remedies from any such person to the fullest extent permitted by law. No mechanically reproduced, illegible, incomplete, forged, software-generated or other automated multiple entries will be accepted. Sponsor reserves the right to modify, extend, suspend, or terminate the Contest if it determines, in its sole discretion, that the Contest is technically impaired or corrupted or that fraud or technical problems, failures or malfunctions or other causes beyond Sponsor’s control have destroyed or severely undermined or to any degree impaired the integrity, administration, security, proper play and/or feasibility of the Contest as contemplated herein. In the event an insufficient number of eligible entries are received and/or Sponsor is prevented from awarding prizes or continuing with the Contest as contemplated herein by any event beyond its control, including but not limited to fire, flood, natural or man-made epidemic of health of other means, earthquake, explosion, labor dispute or strike, act of God or public enemy, satellite or equipment failure, riot or civil disturbance, terrorist threat or activity, war (declared or undeclared) or any federal state or local government law, order, or regulation, public health crisis, order of any court or jurisdiction, or other cause not reasonably within Sponsor’s control (each a “Force Majeure” event or occurrence), then subject to any governmental approval which may be required, Sponsor shall have the right to modify, suspend, extend or terminate the Contest. If the Contest is terminated before the designated end date, Sponsor will (if possible) select the winner in a random drawing from all eligible, non-suspect entries received as of the date of the event giving rise to the termination. Inclusion in such drawing shall be each entrant’s sole and exclusive remedy under such circumstances. Only the type and quantity of prizes described in these Official Rules will be awarded. These Official Rules cannot be modified or amended in any way except in a written document issued in accordance with law by a duly authorized representative of Sponsor. The invalidity or unenforceability of any provision of these rules shall not affect the validity or enforceability of any other provision. In the event that any provision is determined to be invalid or otherwise unenforceable or illegal, these rules shall otherwise remain in effect and shall be construed in accordance with their terms as if the invalid or illegal provision were not contained herein. WINNER’S LIST/OFFICIAL RULES: To obtain a copy of any legally-required winner list, send a self-addressed stamped envelope to: Kika’s “Just Dance 2018” Facebook/Instagram/Twitter Contest Winner List, 8 N. San Pedro, Suite 230, San Jose, CA 95110. All such requests must be received within one (1) month after the end of the Promotion Period. These Official Rules will be posted online during the Promotion Period.